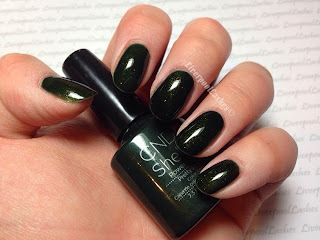 LiverpoolLashes Beauty Blog: An Underrated Shellac Shade! How many of us open our wardrobe doors and reach for the same outfits all of the time? It's hilarious really as if you're anything like me, you'll probably have some amazing new clothes that still have their tags attached whilst the one you've reached for are probably well washed, a little bobbled even. Where am I going with this? It's exactly the same with your CND Shellac (or any other brand you use) I know I definitely do it! You're sat at your nail desk, contemplating your new nails and you probably always gravitate towards the same certain shades - am I right?! As I shared in yesterdays post (click here to read it) I mentioned that I used CND Shellac Pretty Poison under my foils since it would make no difference as it wouldn't be shown and also, it means that I can save a more popular colour for when it's actually needed. My nails are currently shorter than usual as I had a few unfortunately incident, breaking some on one hand but when I applied Pretty Poison, despite them being shorter I really loved the colour. I wanted to write this post to draw your attention to it. It's no coincidence that your clients will often pick the colours you like as if they ask for a pink you will naturally show them your favourite shade of it. If the client asks for a dark shade, why not make sure that this is one of the colours you show them?! Green might not be your favourite colour but I have at least two clients that it's actually one of their favourite shades! If you wanted an even darker version you could layer it over Black Pool or Overtly Onyx - whichever of those you use less! The final point I want to make is that if your Pretty Poison has rarely or even never been used, it's the best bottle to use! It will be a joy to apply as we all know that the well loved shades are likely to be a little thicker! Please make sure you're following my Facebook Page to keep up to date with my blog posts, tutorials and ideas!